My friend Tomoko was visiting from San Francisco and we met at Trident to grab brunch last Saturday morning. She moved more than five years, so it was so terrific to see her again and get to catch up. It was a beautiful day and she was excited to see the foliage. 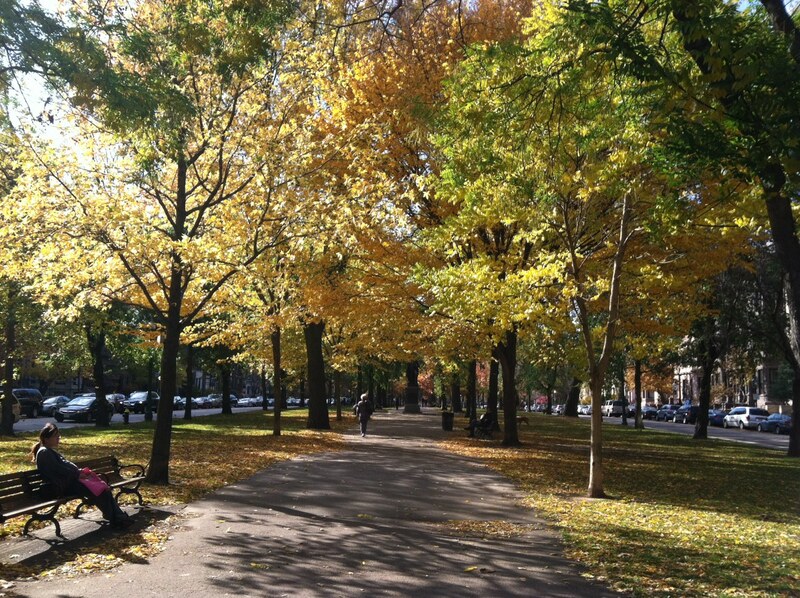 We walked along Comm Ave and snapped photos of the gorgeous trees. Tomoko brought me a box of peanut brittle from See’s Candies in San Francisco. She said she always brings it to her mom in Japan because her mom loves it too. I carried it with us as we walked along Comm Ave and then sat in a Starbucks, sipping coffees and chatting about how things have changed since we were last in Boston together. It was such a fantastic day. I brought the box of peanut brittle home and Andrew and I broke it open a few days later. And we ate the whole box. Holy crap, peanut brittle is amazing. I’m appalled that I’ve lived all these years without it. According to Wikipedia, you make peanut brittle by heating sugar and water. When caramelized, peanuts, spices, and peanut butter are then mixed in. The hot candy is poured out onto a flat surface for cooling and is troweled to make it a uniform thickness. When the brittle cools, it is broken into pieces. This sounds rather complicated, so I doubt I’ll be trying it at home. But luckily, See’s Candies ships pretty much anywhere. You know what I’ll be eating this holiday season.